Jongor of Lost Lemuria appeared a few years after Captain Future in the pages of Fantastic, the weaker fantasy-themed younger brother of Amazing Stories, but like the good captain he saw a resurgence in the 1960s and 70s paperbacks. That was good enough to get him a Frank Frazetta cover, and to cement his reputation as one of the few of the seemingly countless clones of Tarzan to achieve a modicum of fame in the post-World War II period. 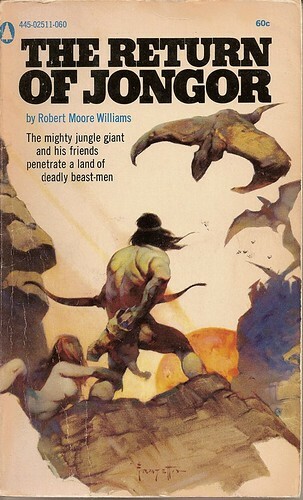 Jongor isn’t much of a Tarzan clone, but then Robert Moore Williams wasn’t much of a writer. Cliches blast from a Williams story like water from a cracked fire hydrant, and after a while the effect is heady and quite enjoyable. The stereotype is that pulp writers wrote as fast as their fingers could move, and Williams’s prose certainly suggests he didn’t spend a lot of time polishing up his drafts. Still, there’s a crazy idea-per-minute panache to his tales that I’ve never seen equaled by any of his pulp contemporaries, including writers remembered today as masters of their craft. I love Robert Moore Williams despite the flaws in his writing—and perhaps because of them. We’ll be seeing a lot more of his books in the days and months to come, as I’ve built up quite a collection.